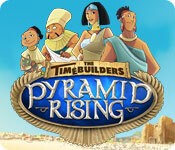 Bring hope to the people of Egypt in The Timebuilders: Pyramid Rising, an exciting Time Management game! Assistant to the Royal architect Senmut, you have been appointed the daunting task of reconstructing villages and bringing hope to the people of Egypt. Only you can save them from banishment to eternal darkness by the mighty god, Amen-Ra. Hire workers, manage resources, build structures and gather stone all while fending off alligator attacks and more! Jane and Dr. Herzle have made a breakthrough in reincarnation studies but their hard work is compromised when Jane is kidnapped!